The USB 2.0 to IDE or Serial ATA Controller from Cables To Go turns any IDE or SATA drive into a convenient external drive. 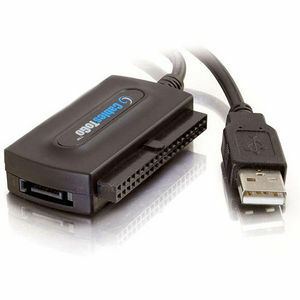 Simply connect one IDE/ATAPI or SATA-based mass storage device through a USB port to easily transfer files from a computer or notebook, back up files or store large file archives on an external hard drive. The hi-speed USB interface enables easy installation with its plug-and-play design. The adapter supports all existing IDE/ATAPI devices such as Iomega Zip, CD-ROM, CD-RW, DVD-ROM and IDE hard drives, and works with any SATA hard drive from 80GB to 500GB.